Sometimes it’s best to dispense with the bells and whistles. Sometimes it’s refreshing to see a game free of bloat, with no mediocre ideas, just doing one thing very well. A Ride into the Mountains ($1.99) does just that. 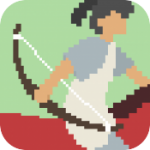 Developers Chia-Yu Chen and Lee-Kuo Chen present a simple story through basic gameplay and a stunning pixelated setting. As “Zu," you ride off to explore a mysterious relic. The story is basic, and I don’t remember much of the details because, frankly, they aren’t so important. Most of the game is spent riding horseback and firing arrows at baddies. 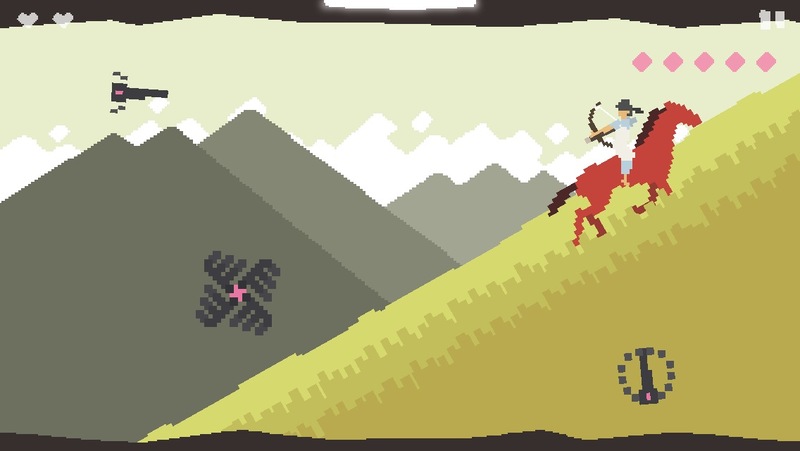 You use tilt controls to steer the horse, and pull back and aim to fire arrows. It’s like Angry Birds, but instead of pulling back more to shoot farther, you pull back for a longer period of time. I wasn’t into this at first. I wanted to shoot fast and furious, but it does match the games thoughtful, contemplative pace. Simply shooting enemies isn’t enough. You’ve got to know when and where to shoot, and figuring it out is a nice little meta game. It’d be a stretch to call them puzzles, but they do make A Ride into the Mountains a bit challenging and more than just a shooting gallery. The tilt controls weren’t my favorite, but they were reasonably well done and not a huge hindrance to gameplay. They also add some much needed challenge. Though the gameplay remains basically the same, with minor additions like a nice bullet time-type feature, each level’s setting is very distinctive. There are stages in bird’s-eye view and in profile. In between levels, the story advances very slowly, and you get a nice proverb while you’re feeding your horse and relaxing by the fire. The gameplay and story are fine, but not that interesting. The visuals, on the other hand, are gorgeous. The developers understand that games don’t necessarily need more things on the screen to engage. Sometimes, a beautiful, colorful sunset or a clear, reflective lake can be more effective than high resolution graphics. If Bob Ross had been a level designer, he might have made A Ride into the Mountains, because these are some happy trees, indeed. Your horse moves with grace, and the art is fluid and clear. The music and sounds are just as good, quiet and peaceful sometimes, but driving and purposeful when necessary. The graphics evoke Another World, and the mood recalls Team Ico, but on a much smaller scale. It never attains the emotional rush of Ico or Shadow of the Colossus, but it never really tries. This isn’t a novelistic game. It’s poetic. It doesn’t say much, but it says it with quiet elegance.